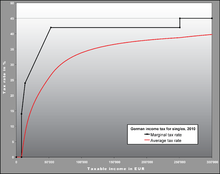 German progressive tax rates for different incomes. Progressive tax systems require the rich to pay taxes at higher rates, to make it possible to raise larger total sums to pay for governmental functions. Some argue such systems are primarily for wealth redistribution. Redistribution of income and redistribution of wealth are respectively the transfer of income and of wealth (including physical property) from some individuals to others by means of a social mechanism such as taxation, charity, welfare, public services, land reform, monetary policies, confiscation, divorce or tort law. The term typically refers to redistribution on an economy-wide basis rather than between selected individuals. Interpretations of the phrase vary, depending on personal perspectives, political ideologies and the selective use of statistics. It is frequently heard in politics, usually referring to perceived redistributions from those who have more to those who have less. Occasionally, however, it is used to describe laws or policies that cause opposite redistributions that shift monetary burdens from wealthy to low-income individuals. The phrase can be emotionally charged and used to exaggerate or misconstrue the motivations of opponents during political debates. For example, if an individual politician calls for increased taxes on higher income individuals, their sole focus may be to raise funds for specific government programs, tapping the largest available sources while realizing that low-wage workers have little or no excess income to draw tax revenues from. Political opponents might argue that this politician's prime motivation is to redistribute wealth, when redistribution is not their goal. The phrase is often coupled with the term "class warfare," with high income earners and the wealthy portrayed as victims of unfairness and discrimination. Redistribution tax policy should not be confused with predistribution policies. "Predistribution" is the idea that the state should try to prevent inequalities occurring in the first place rather than through the tax and benefits system once they have occurred. For example, a government predistribution policy might require employers to pay all employees a living wage, not just a minimum wage, as a "bottom-up" response to widespread income inequalities or high poverty rates. Many alternate taxation proposals have been floated without the political will to alter the status quo. One example is the proposed "Buffett Rule", which is a hybrid taxation model composed of opposing systems, intended to minimize the favoritism of the special interest tax design. The effects of a redistribution system are actively debated on ethical and economic grounds. The subject includes analysis of its rationales, objectives, means, and policy effectiveness. In ancient times, redistribution operated as a palace economy. These economies were centrally based around the administration, so the dictator or pharaoh had both the ability and the right to say who was taxed and who got special treatment. Another early form of wealth redistribution occurred in Plymouth Colony under the leadership of William Bradford. Bradford records in his diary that this "common course" bred confusion, discontent, distrust, and the colonists looked upon it as a form of slavery. A closely related term, distributism (also known as distributionism or distributivism), is an economic ideology that developed in Europe in the late 19th and early 20th century based upon the principles of Catholic social teaching, especially the teachings of Pope Leo XIII in his encyclical Rerum novarum and Pope Pius XI in Quadragesimo anno. More recently, Pope Francis in his Evangelii Gaudium, echoed the earlier Papal statements. Different types of economic systems feature varying degrees of interventionism aimed at redistributing income, depending on how unequal their initial distributions of income are. Free-market capitalist economies tend to feature high degrees of income redistribution. However, Japan's government engages in much less redistribution because its initial wage distribution is much more equal than Western economies. Likewise, the socialist planned economies of the former Soviet Union and Eastern bloc featured very little income redistribution because private capital and land income – the major drivers of income inequality in capitalist systems – was virtually nonexistent; and because the wage rates were set by the government in these economies. Today, income redistribution occurs in some form in most democratic countries through economic policies. Some redistributive policies attempt to take wealth, income, and other resources from the “haves” and give them to the “have-nots,” but many redistributions go elsewhere. “The direct transfer of cash and services is only one way that government transfers income. Another way is by restricting competition among producers. The inevitable consequence—indeed, the intended consequence—of these restrictions is to enrich organized groups of producers at the expense of consumers. Here, the transfers are more perverse than with Medicare and Social Security. They help relatively wealthy producers at the expense of relatively poor (and, in some cases, absolutely poor) consumers. Many government restrictions on agricultural production, for example, allow farmers to capture billions of consumer dollars through higher food prices (see agricultural subsidy programs). Most of these dollars go to relatively few large farms, whose owners are far wealthier than the average taxpayer and consumer (or the average farmer). Also, wealthy farmers receive most of the government’s direct agricultural subsidies." Some consider the U.S. government’s progressive-rate income tax policy as redistributive, because some of the tax revenue goes to social programs such as welfare and Medicare. In a progressive income tax system, a high income earner will pay a higher tax rate (a larger percentage of their income) than a low income earner; and therefore, will pay more total dollars per person. Other taxation-based methods of redistributing income are the negative income tax for very low income earners and tax loopholes (tax avoidance) for the better-off. Two other common types of governmental redistribution of income are subsidies and vouchers (such as food stamps). These transfer payment programs are funded through general taxation, but benefit the poor or influential special interest groups and corporations. While the persons receiving transfers from such programs may prefer to be directly given cash, these programs may be more palatable to society than cash assistance, as they give society some measure of control over how the funds are spent. It has been argued that the U.S. Social Security program redistributes income from the rich to the poor, but the majority of those receiving Social Security earned their benefits through tax withholding from their paychecks or quarterly income statements, and most benefits are indexed to the actual earning levels of individual workers. Only the highest- and lowest-income workers fall outside normal rates. In addition, Social Security deductions are only taken from the first $200,000 in income, with nothing further taken from higher incomes over that amount. In other words, a person who earns $100 million a year pays the same Social Security tax as another worker who earns $200,000 a year. Contrary to popular belief, a recent study found that, overall, the Social Security System was slightly regressive against the poor and not redistributive, once important factors were taken into account (for example, the longer life expectancy of the wealthy when compared to the poor gives them more years to collect benefits). Governmental redistribution of income may include a direct benefit program involving either cash transfers or the purchase of specific services for an individual. Medicare is one example. Medicare is a government-run health insurance program that covers people age 65 or older, certain younger people with disabilities, and people with end-stage renal disease (permanent kidney failure requiring dialysis or a transplant, sometimes called ESRD). This is a direct benefit program because the government is directly providing health insurance for those who qualify. The difference between the Gini index for the income distribution before taxation and the Gini index after taxation is an indicator for the effects of such taxation. Wealth redistribution can be implemented through land reform that transfers ownership of land from one category of people to another, or through inheritance taxes or direct wealth taxes. Before-and-after Gini coefficients for the distribution of wealth can be compared. The objectives of income redistribution are to increase economic stability and opportunity for the less wealthy members of society and thus usually include the funding of public services. One basis for redistribution is the concept of distributive justice, whose premise is that money and resources ought to be distributed in such a way as to lead to a socially just, and possibly more financially egalitarian, society. Another argument is that a larger middle class benefits an economy by enabling more people to be consumers, while providing equal opportunities for individuals to reach a better standard of living. Seen for example in the work of John Rawls, another argument is that a truly fair society would be organized in a manner benefiting the least advantaged, and any inequality would be permissible only to the extent that it benefits the least advantaged. Some proponents of redistribution argue that capitalism results in an externality that creates unequal wealth distribution. Some[who?] argue that wealth and income inequality are a cause of economic crises, and that reducing these inequalities is one way to prevent or ameliorate economic crises, with redistribution thus benefiting the economy overall. This view was associated with the underconsumptionism school in the 19th century, now considered an aspect of some schools of Keynesian economics; it has also been advanced, for different reasons, by Marxian economics. It was particularly advanced in the US in the 1920s by Waddill Catchings and William Trufant Foster. There is currently a great debate concerning the extent to which the world's extremely rich have become richer over recent decades. Thomas Piketty's Capital in the Twenty-First Century is at the forefront, critiqued in certain publications such as The Economist. Peter Singer's argument contrasts to Thomas Pogge's in that he states we have an individual moral obligation to help the poor. Using statistics from 23 developed countries and the 50 states of the US, British researchers Richard G. Wilkinson and Kate Pickett show a correlation between income inequality and higher rates of health and social problems (obesity, mental illness, homicides, teenage births, incarceration, child conflict, drug use), and lower rates of social goods (life expectancy, educational performance, trust among strangers, women's status, social mobility, even numbers of patents issued per capita), on the other. The authors argue inequality leads to the social ills through the psychosocial stress, status anxiety it creates. A 2011 report by the International Monetary Fund by Andrew G. Berg and Jonathan D. Ostry found a strong association between lower levels of inequality and sustained periods of economic growth. Developing countries (such as Brazil, Cameroon, Jordan) with high inequality have "succeeded in initiating growth at high rates for a few years" but "longer growth spells are robustly associated with more equality in the income distribution." Public choice theory states that redistribution tends to benefit those with political clout to set spending priorities more than those in need, who lack real influence on government. The socialist economists John Roemer and Pranab Bardhan criticize redistribution via taxation in the context of Nordic-style social democracy, highlighting its limited success at promoting relative egalitarianism and its lack of sustainability. They point out that social democracy requires a strong labor movement to sustain its heavy redistribution, and that it is unrealistic to expect such redistribution to be feasible in countries with weaker labor movements. They point out that, even in the Scandinavian countries, social democracy has been in decline since the labor movement weakened. Instead, Roemer and Bardhan argue that changing the patterns of enterprise ownership and market socialism, obviating the need for redistribution, would be more sustainable and effective at promoting egalitarianism. Marxian economists argue that social democratic reforms – including policies to redistribute income – such as unemployment benefits and high taxes on profits and the wealthy create more contradictions in capitalism by further limiting the efficiency of the capitalist system via reducing incentives for capitalists to invest in further production. In the Marxist view, redistribution cannot resolve the fundamental issues of capitalism – only a transition to a socialist economy can. 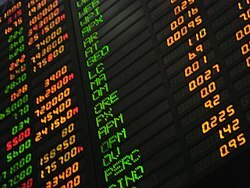 ^ Investopedia. "The Advantages of a Progressive Tax". Retrieved 7 May 2017. ^ Kessler, Glenn. "Fact Checker: Elizabeth Warren's claim that the bottom 90 percent got 'zero percent' of wage growth after Reagan". Washington Post. Retrieved 7 May 2017. ^ Reich, Robert (4 May 2017). "Trump's Stock in Trade is Cruelty. Count the ways". Newsweek. Retrieved 7 May 2017. ^ FAIR (July 2009). "For Media, 'Class War' Has Wealthy Victims, Rich getting richer seldom labeled as belligerents". Retrieved 8 May 2017. ^ F.A. Cowell ( 2008). "redistribution of income and wealth," The New Palgrave Dictionary of Economics, 2nd Edition, TOC. ^ Rugaber, Christopher S.; Boak, Josh (27 January 2014). 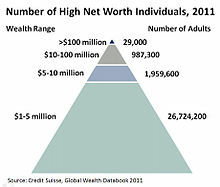 "Wealth gap: A guide to what it is, why it matters". AP News. Retrieved 27 January 2014. ^ de Blois, Lukas; R.J. van der Spek (1997). An Introduction to the Ancient World. Translated by Susan Mellor. Routledge. pp. 56–60. ISBN 978-0-415-12773-8. ^ a b "William Bradford – Facts & Summary". History.com. Retrieved 3 January 2017. ^ Hunt III, Arthur W. "Pope Francis Needs Distributism: Americans and popes alike can embrace a humane alternative to modern capitalism". The American Conservative. Retrieved 8 May 2017. ^ Rosser, Mariana V. and J Barkley Jr. (23 July 2003). Comparative Economics in a Transforming World Economy. MIT Press. p. 11. ISBN 978-0262182348. Economies vary based on the extent to which and the methods by which governments intervene to redistribute income. This depends partly on how unequal income is to begin with before any redistributive policies are implemented. Thus the Japanese government does much less redistributing than the governments of many other capitalist countries because Japan has a more equal distribution of wages than most other capitalist countries. Command socialist economies also have had less income redistribution because governments initially control the distribution of income by setting wages and forbidding capital or land income. ^ a b Lee, Dwight R. "Redistribution". Library of Economics and Liberty. ^ Barbour, Christine, and Gerald C. Wright. Keeping the Republic: Power and Citizenship in American Politics. 7th ed. : CQ, 2016. ^ Prante, Gerald, and Scott A. Hodge. "The Distribution of Tax and Spending Policies in the United States." Tax Foundation. N.p., 13 Nov. 2013. Web. ^ Harvey S. Rosen & Ted Gayer, Public Finance pp. 271–72 (2010). ^ Balls, Andrew. "Social Security Does Not Redistribute Income". National Bureau of Economic Research. Retrieved 8 May 2017. ^ Rector, Robert. "The Redistributive State: The Allocation of Government Benefits, Services, and Taxes in the United States." The Heritage Foundation. N.p., 15 Sept. 2015. Web. ^ Allgoewer, Elisabeth (May 2002). "Underconsumption theories and Keynesian economics. Interpretations of the Great Depression" (PDF). Discussion paper no. 2002-14. University of St. Gallen. ^ "Forget the 1%; Free Exchange", The Economist, 8 November 2014, p. 79. ^ Stafforini, Pablo. "Famine, Affluence, and Morality, by Peter Singer". Retrieved 3 January 2017. ^ "Fighting Poverty". Retrieved 3 January 2017. ^ "The Spirit Level - The Equality Trust". Retrieved 3 January 2017. ^ Berg, Andrew G.; Ostry, Jonathan D. (2011). "Equality and Efficiency". Finance and Development. International Monetary Fund. 48 (3). Retrieved 10 September 2012. ^ Plotnick, Robert (1986) "An Interest Group Model of Direct Income Redistribution", The Review of Economics and Statistics, vol. 68, no. 4, pp. 594–602. ^ "Market socialism, a case for rejuvenation", by Pranab Bardhan and Johen E. Roemer. 1992. Journal of Economic Perspectives, vol. 6, no. 3, p. 104: "Since it (social democracy) permits a powerful capitalist class to exist (90 percent of productive assets are privately owned in Sweden), only a strong and unified labor movement can win the redistribution through taxes that is characteristic of social democracy. It is idealistic to believe that tax concessions of this magnitude can be effected simply through electoral democracy without an organized labor movement, when capitalists organize and finance influential political parties. Even in the Scandinavian countries, strong apex labor organizations have been difficult to sustain and social democracy is somewhat on the decline now." ^ Market Socialism: The Debate Among Socialists, by Schweickart, David; Lawler, James; Ticktin, Hillel; Ollman, Bertell. 1998. pp. 60–61: "The Marxist answers that...it involves limiting the incentive system of the market through providing minimum wages, high levels of unemployment insurance, reducing the size of the reserve army of labour, taxing profits, and taxing the wealthy. As a result, capitalists will have little incentive to invest and the workers will have little incentive to work. Capitalism works because, as Marx remarked, it is a system of economic force (coercion)."